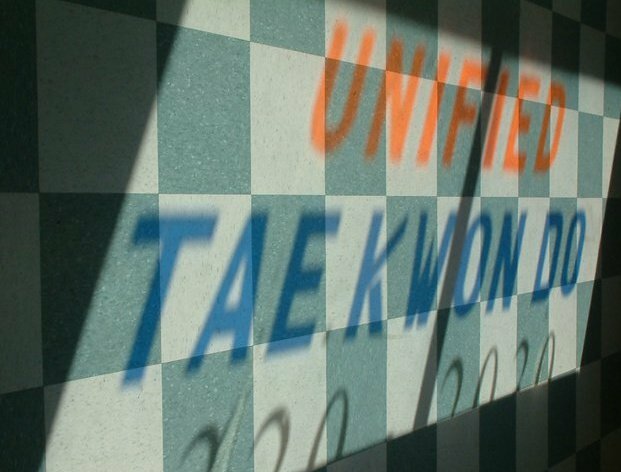 WHAT IS UNIFIED TAE KWON-DO? UTKD is an organization of schools and instructors who work together, follow the same organizational guidelines, teach the same techniques and have the same purposes and goals. The goals include teaching and helping the student to set and attain goals of both mental and physical self-improvement while maintaining a respectable, pleasant atmosphere in an environment where everyone works toward achieving the goals of each individual. Students sit cross legged, hands on knees with eyes closed for a 1-2 minute period while relaxing the and concentrating on a breathing exercise. Breathing should be slow and deep alternating between stomach and chest. This is used to clear ones mind from the day activities so that 100% concentration can be focused on the class. Bowing is an oriental custom for showing respect between people. Loosening and stretching exercises at the beginning of class reduces chance of straining or pulling a muscle. A pattern is a combination of pre-determined offensive movements against imaginary opponents. They should be performed with smooth, graceful body motions climaxed with the timing, speed and power of each individual technique. A pattern is a series of predetermined movements, attacks and blocks against imaginary opponents coming from different directions. These movements are to be performed with grace and beauty. The patterns get their name from great people in Korean history, people noted for their loyalty, respect and strong spirit. The student learns not only the movements of the patterns, but tries to understand the spirit of these heroes as well. Free Sparring Patterns provide an interesting way for students to practice their kicking and punching techniques, by applying them to many imaginary opponents. The patterns teach students how to move effectively. This type of exercise improves body agility and flexibility of movement. Directly applicable to free sparring, these techniques provide the variety necessary for intelligent free sparring. Step sparring is a series of prearranged attack and defense combinations that are practiced with a partner to develop timing and distance. This is a kicking exercise to practice blocks and counter-attacks. Partners work together cooperating with one other to gauge their distance. This improves the student’s judgement and is an excellent preparation for free sparring. Free Sparring allows the student to combine the timing, speed, judgement and reflexes he has developed and them to use against a partner whose movements are unpredictable. Students learn to free spar after they successfully pass their grading. All students are required to ware safety equipment and no contact is allowed. The students safety comes first in Unified Tae Kwon Do. Releases are taught for an understanding of an attackers weak points. Bag, Hand and Kicking Target drills are important for developing balance, focus, speed, timing and power when hard contact is made. Board breaking is a show of focus, concentration and power used primarily in demonstrations and black belt testing. One never knows when the need for self-defense may occur. Releases are taught for an understanding of an attackers weak points. Unified Tae Kwon Do builds the self-confidence necessary to react in a situation without panic. Through Tae Kwon Do practice, the muscles tone, the body becomes flexible and reflexes become acute. Physically and mentally the student becomes a graceful, well developed person. Breathing is an important element of power that allows one to concentrate his power into the focus point. The student achieves respect for others, pride in himself and an even positioning of personality and confidence. We are here to learn together. Unified Tae Kwon Do offers each person a way to improve himself regardless of his physical condition. Therefore, students should practice together and respect each other’s abilities, accomplishments, and goals. Respect the instructor and senior belts for their knowledge and their willingness to teach. In this way the class will grow with an attitude of mutual improvement. Students with Unified Tae Kwon Do have the opportunity to participate at Unified Tournaments and Tournaments at other skills. Tournaments help test a students skills, provide growth, and relationships with other students that last a lifetime. Unified Tae Kwon Do training can effect your entire outlook on life…You’ll learn to relax, develop a better self-image, and be more able to handle the stress of daily living. A vigorous class will help relieve the tensions and pressures of the tedious day of work or study. Many changes are noticed in the student of Tae Kwon Do including greater emotional stability and improved academic achievement. All parents want their children to develop courage, concentration, perseverance, integrity and courtesy. Unified Tae Kwon Do enables each student to develop attitudes and patterns necessary for the maximum achievement of his or her potential.